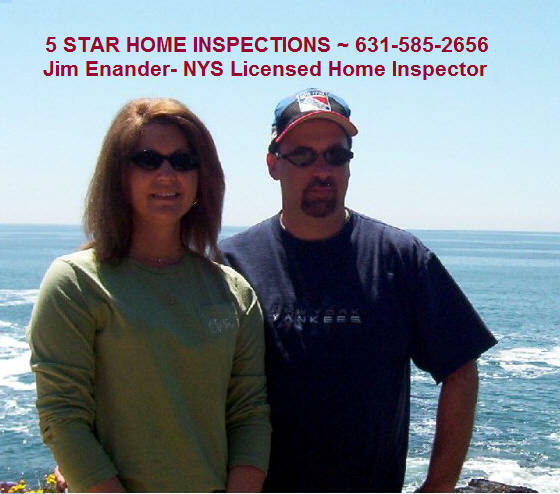 5 STAR HOME INSPECTIONS ~ 631-585-2656 ~ Jim Enander NYS Licensed H.I. 5 Star Home Inspection Caters to the Long Island Market for High quality Inspections for 1 to 4 family homes as well as condominiums and cooperatives. I perform a thorough Inspections after you have signed a Pre-Inspection Agreement which explains exactly what I perform in my analysis. I e-mail you the pre-inspection agreement for your review and signature. I am both Licensed in NYS and Insured, and I attach a copy of both my NYS License and my General Liability Insurance Information with each report. I can be reached 9am to 9pm for Appointments during the week and on weekends for your convenience. At the Conclusion, when I deliver the Inspection, I make myself available to you for as long as you need to understand my findings. This $ 200.00 consulting is at no additional charge to you.